Delving deep in the underground and peripheries of Brazilian rock, Groovie Records keeps digging up many- styled and shaped nuggets in various stages of cutting. The result extends the BRAZILIAN NUGGETSseries, now reaching its second volume. 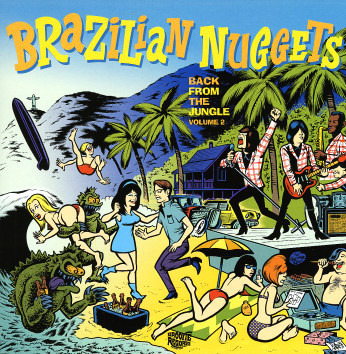 Therefore, THE BRAZILIAN NUGGETS VOLUME 2 continues along the trail paved by its predecessor. One more time a great artwork by DARREN MERINUK, amazing work keeping all the spirit of the brazilian way of living the rock'n'roll. Again the second volume came full of weird'n'garage psych monster themes. Obscure tracks by Os Espiões, Avanço 5, Diana, Giovanne, Sonny Delane, Modern Sound Six, among others. We tryed to keep the spirit of the 60's punk, full of fuzz and garage punk, rhythm and a bunch of never seen photos and record covers. The perfect christmas present for you monsters!